Photograph This! : At the Mima Mounds, where we lay our scene. Photographers like to complain that a fun photo gig is hard to find and that and a client fun to work with is rare. But, this last June I got proof that fun shoots and clients do exist and sometimes come together! Two clients actually, who needed a portait, were not afraid to experiment, came with good ideas and a budget to do things right. Awesomeness. I had met with them a couple of weeks before. The theme of the portrait was 'Life is a Journey'. So I suggested to shoot at a location that had a feeling of remoteness to it (but was just a couple of hours drive from a large city) and to bring objects that where meaningful to them to the shoot. 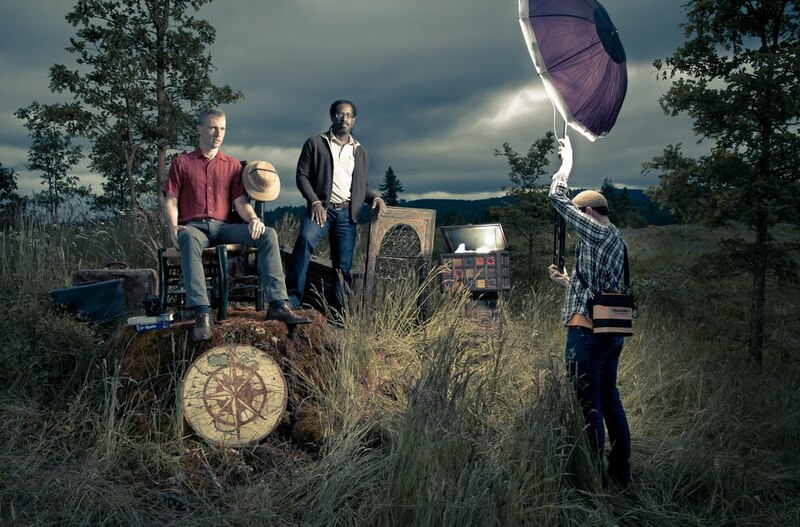 You can see my clients looking cool in this image, a shot of the set taken with the final lights set up. It shows the position of the assistant, whom I had to take out in post for the final shoot. He has to stay close to the subjects to make sure the light on them is soft. The location is the Mima mounds, a little park South of Olympia, WA. It is a vast natural area with an almost geometric pattern (the mounds!) surrounded by tall trees. They frame the scene nicely, and I am a sucker for tall prairy grass. Moreover a path goes through the grass and allows easy movement of props and equipment. The team included me and two assistants. I decided to shoot with the 7' PL umbrella as fill next to camera and the softlighter as key to camera right. 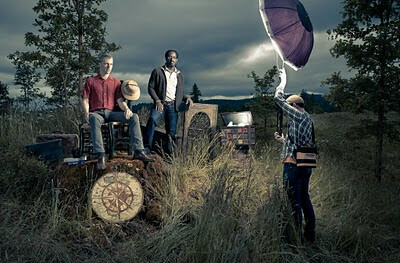 I wanted enough power to underexpose the sky 1.5 stops, so for a scene this big speedlights would not cut it. I love them because they are so portable, but sometimes one has to use the big guns! I used two Einstein heads, which did the job without flinching. The large softbox is well, very large and does not like the wind. So we rigged it to the ground with some ropes and tent stakes. As we had everything pretty much planned the whole shoot took just a couple hours. I used a different palette for the final image, but this one is a bit more eery and it works well for my portfolio. The lighting striking from the Softlighter is not coming from the Einstein head, it's a break in the clouds from which the Sun shone through for a few seconds. Sometimes a photographer gotta be fast.